Is Charcoal Whitening Bad for your Teeth? Charcoal whitening toothpaste is the latest craze all over social media – but is it good for your teeth? The claim is that the activated charcoal removes staining caused by liquids such a coffee, tea and red wine. 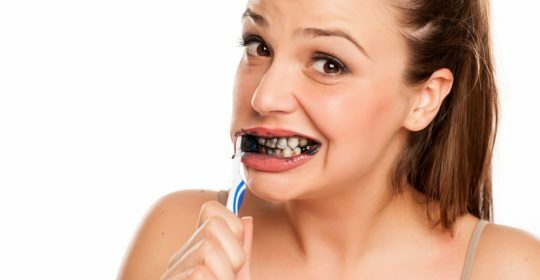 This article will explore the effects of charcoal toothpaste, the benefits and risks from frequent use. Activated charcoal is finely pressed black powder made from materials such as bone char, coconut shells and coal. It’s not like regular barbecue grill charcoal, it’s more refined, cleaner and fit for medical and cosmetic use. The charcoal is processed over a high heat which activates the material and removes harmful substances. Activated charcoal has a negative electrical charge which acts as a magnet to positively charged toxins. The charcoal can not be absorbed by the body, rather it carries stains, and other toxins to the surface. For teeth, it traps stain toxins and draws them out. Charcoal toothpaste should be used with caution. Although the product can reduce discolouration, it comes with some consequences. The abrasiveness of charcoal can erode enamel over time. In the short term, activated charcoal will whiten teeth, however as the enamel erodes it will reveal the inner dentin. Dentin is the inner part of the tooth, and is naturally a darker colour. When dentin is revealed it makes teeth look yellow. Other negative effects include increased sensitivity and tooth decay. Charcoal toothpaste should be used in moderation, and by recommendation from your dentist. It’s not all scary! Charcoal toothpaste can be used in moderation. The abrasive nature of charcoal erodes enamel when it’s used frequently. However when charcoal toothpaste is used in moderation it can have some cosmetic benefits. Charcoal toothpaste can remove surface stains, and reduce bad breath. The usual stain agents are coffee and red wine. Charcoal toothpaste does not work for deeper tooth discolouration. Consult your dentist to determine whether you’re safe to use charcoal toothpaste in moderation for surface stains. Here’s the bad news: charcoal toothpaste does not have the seal of approval from the Australian Dental Association. The bottom line is that charcoal toothpaste is not safe to be used frequently. Charcoal is an abrasive material and is not sustainably healthy for teeth. If you’re considering whether charcoal toothpaste is safe for you, consult your dentist. Dentists will be able to assess the state of your teeth and determine if your teeth are at risk of damage from charcoal toothpaste, or if it can benefit your teeth in the short term. Deeper tooth discolouration isn’t treatable with off-the-shelf products like charcoal toothpaste or whitening trays. Deeper discolouration requires bleaching treatments that affect the outer surface of teeth. Redbank Plains Dental is Riverview’s local dentist. To find out more about teeth whitening services we offer, contact us today.